Justine – After a steaming bowl of porridge for breakfast, we set off to visit Kanrood, the village our guide Hossein is originally from. As we drove to the foot of the jungle-clad mountains, the kids doing ‘bin man’ hanging on the back ladders of Kabylie , we could have been in Bali, with paddy fields stretching out in front of us. It is rice-planting season, and red and black clad bottoms dotted the fields, as their owners stooped in the backbreaking job of pushing the lush green shots into the watery mud. The next day we had a family meeting to discuss the length of time we were spending in the car every day. Hossein our guide calculates everything in an ‘Iranian time and distance’ that bares no relation to reality. A two hour journey generally takes six hours. When we got out the map, we realised that the itinerary that had been devised for us was totally unrealistic in a normal car, let alone in Kabylie. Hossein protested that being British, there was no way we could change the itinerary and we had to go to all the places laid out for us. To add in a bit of spice to the situation, we then told him that our Turkmenistan visas had not come through yet and if they did not, we would have to change our route altogether. Hossein nearly had a heart attack and we all decided to look at the map again when his heart rate had returned to normal. Travelling in an old car, across numerous borders and countries with changing security situations, you have to be totally flexible, not knowing where you will sleep or even what country you will be in over the next few days. If the route changes, can you get a visa easily for the alternative? Even food is an unknown, as we have no room to store supplies and no fridge, we just have to scour the shelves of unknown products and try to cobble something together on a daily basis. Next we headed to Masuleh, a wonderful ancient mud brick village, which was not diverging from our route, so Hossein was happy. En route we stopped at a Caspian Sea lagoon where a number of speedboats were bobbing amongst the reeds. I thought the boat trip on offer would be a put-putt-putt in the baking heat, but Hector had clocked the number of ‘horse-backs’ (horse-power) the engine had and excitedly insisted we all go. We had a fabulous hour firing about the marsh, with our irritating headscarves conveniently blown off and flocks of herons taking to the sky at every rev of the engine. No ecology protection here. We exited out of the lagoon into a harbour full of old rusty Russian ships, plying the trade between Iran and Russia. The ships must have been built on the Caspian, as it is really a giant lake rather than a sea. Continuing our route to Masuleh, Hossein started saying it was only another 150km. What! We had already driven 5 hours and the whole journey was meant to be 200km. Darn it! What is it with this Iranian timing and distance malarkey! The heavens opened and fat drops of rain were soon pounding the windscreen so hard that we had to manually take over the wiper’s job – its one speed was not man enough for the quantity of water descending on us. As night set in and Kabylie started to climb the jungled mountainside we were all thinking the same thing …….stuff camping, we want a hotel. On asking Hossein told us that we could not deviate from our plan at all and could not change to a hotel, however, the quantity of water pouring for the heavens and the quality of Sal and Mikes picnic tent were obviously playing on his mind for when Kabylie finally puffed her way into Masuleh, Hossein had organised a little local apartment for us over some shops – hurray for having a guide – ludicrous timings forgiven. Mesuleh was gorgeous. Inhabited for a millennium this mud brick flat roofed little town was perched in the mountains, its cool climate like drinking peppermint water. We wandered the lanes and rooftops, haggled over brightly coloured slippers knitted by toothless old ladies and bought dried borage flowers from baskets along the path to aid restful sleep. Poor Petra missed the morning’s activities, as she was feeling ill, either due to altitude sickness or from being gassed by the stove in the bedroom. Either way, she had recovered by the afternoon so could join us for a bit of dressing up in the traditional garb of the village. Sadly no one has worn these brightly coloured clothes any more for 150 years, but Iranian tourists love to dress up in them and we did not want to feel left out. That night Mike and I went for a stroll to buy some bread. The soft dough balls looked so pleasing that I could not resist asking the baker if I could squish one and make a loaf. ‘Loaf’ is not really the correct word as the bread is usually flat in Iran. We had seen bread baked on pebbles; bread with a bubble wrap pattern, bread stuck on the side of the oven and now this bread needed ones fingers punched into it. Mr. baker let me make a whole batch for the queue of peering on-lookers and the rush for infidel made bread was so great that I said I would come back with my children the next day and put them to work, which I duly did. The next part of our adventure was to take us back in time to the 12th century when Hasan-e Sabbah became leader of the radical Ismali sect, known as the Assassins and became the terror of the known world. We were all highly excited to be going to the Alamut valley, the Assassin stronghold, with none other than Michael Oliver, one of the original British Museum backed team, who discovered the castle in 1960. We entered the valley from the city of Qazvine where we stopped to marvel at the fabulous Bazar and caravanserais which one day will be converted into fabulous boutique hotels, by the Arab world looking for Halal holiday destinations. In 1960, Mike had to make the journey over the Alborz Mountains from the Caspian Sea side with a mule train. With another of Hossein’s random estimations of time, our journey today was almost as arduous as Kabylie struggled up the 3000+ meter passes. The scenery however made up for it. Red earth, juxtaposed against green fertile hillsides, cultivated with wheat but awaiting the planting of a new crop of fruit and nut trees. From looking at Dad’s old footage of the 1960 expedition, I had been expecting a dry, rocky landscape, but this was both beautiful and bountiful. We camped at Evan Lake, which ripples at the bottom of an amphitheatre of mountains, the snow capped Alborz, glinting behind an inner circle of red-rock hills. As Hector rejoiced at being able to build a fire, the first of our trip, Petra and I decided to go for a run around the lake, ridiculous headscarves and all. We had to wait until dusk before we could swim and even then had to be fully clothed, but it was still glorious floating in the cool and just seeing the ring of mountains around the lake from the corner of your eyes. The stars began to appear like an unseen hand casting diamonds onto deep velvet. The next day, excitement mounted as we zigzagged our way up the Alamut valley. Mike could not believe that all the green had been planted in the last 60 years. At last the great rock, like a kneeling camel came into view with the Alamut Castle perched on the top. Here was the stronghold of Hasan-e Sabbah, the leader of the Assassins. It is said that Alamut Castle contained a secret ‘Garden of Paradise’ which was used to quash all fear of death for Hasan’s soldiers. The soldiers were cunningly given hashish until they fell asleep. On waking totally stoned, they would find themselves being tended by dusky maidens in a garden overflowing with virgins, milk, honey and other delights a rock fortress is devoid of. Plied with more drugs, the hapless soldier would awaken back in reality, a flea infested barracks with dubious loos. Thus knowing death in action bought the delights of Paradise, these soldiers became fearless to the extreme and proceeded to carry out political and religious murders across the 12th century world, standing by the body of their victim until they were discovered and killed themselves. Their reputation struck fear into hearts across the world so much so that any murder in Europe was hurriedly blamed on the mysterious Assassins. This fearless lot were locally known as ‘hashish-iyun’ which is the root of the modern English term ‘assassin’. To find out more about the castle and its history and Mike’s 1960’s expedition, you will have to read the newspaper article in the ‘Kids Corner’ written by burgeoning journalist Petra Oliver-Russell. For a possibly more accurate version you can red Peter Willy’s book – Eagles nest! The search for Maymun-Diz was our next adventure. This was the actual assassin castle that Mike’s expedition had re-discovered. As Hector sang the Indiana Jones theme tune, we asked at various villages, which way Maymun Diz was. Much head –shaking and mutterings about the quality of the road and eventually a man on a motorbike was found to lead us there. By this time we were all singing the Indian Jones theme tune and were super excited. Mike was grinning from ear to ear as we left the car and proceeded to walk up a rocky river for about an hour and a half. Avoiding twisting my ankle on the rocks, I read out extracts for Peter Willey the expedition leader’s book ‘the Castle of the Assassins’ and we learnt how Dad aged 19 was the Quarter-master of the expedition and accomplished rock-climber – handy as Maymum-Diz means ‘Castle of the Apes’ and was half way up a cliff-face in caves in the rock. It was a wonderful day reliving Dad’s expedition. We even found the grave of the local climber from the village who had been known as ‘Ape-man’ as he was so proficient. As we had tea at our guide from the village’s home, he told us how he and some friends had illegally dug at Alamut and found an inscribed tablet. Though he was caught and spent 3 nights in prison, it was clearly worth it as he had been able to buy land and a house with the money he got from flogging it to an antiques trader. It could have been a new Rosetta stone, but is now sitting in the loo of some Russian oligarchs private collection. With all the archaeological excitement, I have forgotten to write about poor Kabylie as she had definitely taken second place to Indiana Oliver. The hills of the Alamut valley had taken their toll and a green light on the dashboard kept illuminating with the engine intermittently losing power. As we descended back to the baking plains of Qazvine poor Tom began to stress about whether he could fix her. That’s quite a way to leave the story hanging!!! Let’s hope Tom can fix her. Will our heroes be able to carry on? Will Kabylie see them through? Tune in next week to find out! Loving the blog. Sarah and kids have arrived at house. I’m getting on Bilbao boat right now. Here’s to 2 months in Biarritz! It is wonderful to see lush green Iran… How high are you now? Tom Worm Sal Mike Petra and Hector, I cannot tell you how thrilling it is to get these snippets of your incredible journey. Reading through is a blissful few minutes of chuckling awe, inspiration and yearning to visit these places too – a more than welcome break from the fug of revision. It is so exciting following your progress from behind a laptop screen, I cant imagine how rewarding it must be to reach another summit in Kabylie (love the name by the way) or see the beams on the faces of those you meet! I hope she is coping with the distances, within reason – what an incredible achievement already to have got this far… My hat off to you Tom. All the very very best for the rest of the way wherever it may take you, stay safe and it goes without saying, ENJOY!! Reading with avid interest and following your route from mountain field or olive grove to Caspian coast. 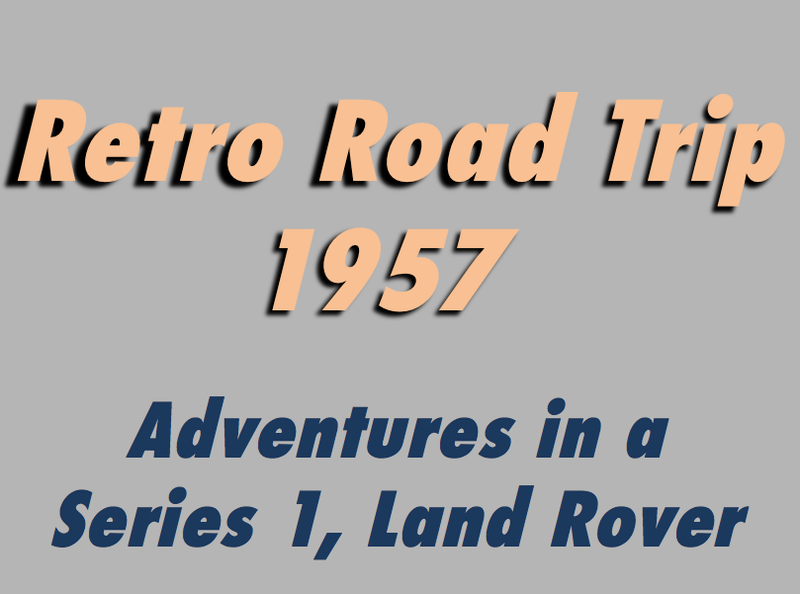 Assassins, ape-men, hashish, porridge all rumbling along in a 1957 Landrover – it all sounds amazing!! Safe travels! !